LINCOLN, Neb. – Michael Dickerson had come up empty in past hunts, but he finally got his Nebraska trophy this past year. 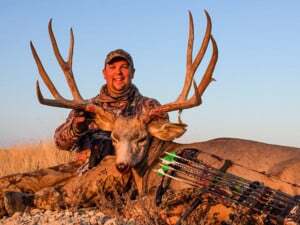 Dickerson, of Davison, Mich., now holds the Nebraska record typical mule deer taken by archery. He stalked and shot the deer, which scored 197-4/8, Sept. 10, 2018, on private land in the badlands of northern Sioux County. “It truly was a privilege to have an opportunity at such a great animal,” said Dickerson, 40. Randy Stutheit, Nebraska big game trophy records coordinator for the Nebraska Game and Parks Commission, said Dickerson’s deer is the second largest typical mule deer entered into the Nebraska records regardless of method of take. The top Nebraska mule deer of 200-3/8 was taken with a muzzleloader by Miles Lemley of Lyman, Neb., in Scotts Bluff County in 2007. The previous archery record was 187-2/8. The Pope and Young Club said Dickerson’s trophy, with its current score, would rank in the top 25 nationally in the typical mule deer archery records maintained by the club. Scoring a trophy is a combination of measurements of antler tine length and mass. The morning of the hunt, Dickerson and a friend located and watched the deer for several hours, anticipating where it would bed so he could stalk within 65 yards. Eventually, he noticed it bedding with three other bucks and the stalk began. “Over the next three hours we played a game of chess, checking each drainage for other animals while quietly sneaking into position,” Dickerson said. The bucks began feeding their way up a valley and into a bowl, which put a small hill between them and the hunters. Dickerson, a board member of the Flint, Mich., chapter of Safari Club International, said he appreciates the opportunity to hunt in Nebraska. For more information on the Nebraska Big Game Records Program, and to browse the record database, visit outdoornebraska.gov/biggametrophyrecords.